Vukovar, October 1991. Credit: www.croatia.org. All rights reserved. 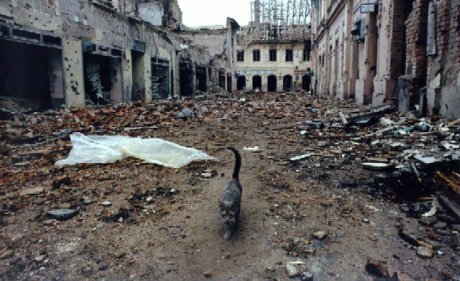 When the Croatian town of Vukovar was taken over by the Serbian Army in 1991 after 90 days of bombing, Alexander Jevtić, a Serb who had made the town his home, found himself in a seemingly impossible position. Once inside the town, Serbian forces set about rounding up Croatian men as young as 16 for transport to a secret detention facility, where many would be tortured and killed. Jevtić was swept up in the expulsion. However, a guard recognized him and instructed him to look for any other Serbians who should be spared from execution. “Pick wisely,” he told Jevtic. Jevtić understood that he was taking a potentially fatal risk, but nevertheless he began to call out Croatian men he knew by Serbian names, tapping them on the foot so that they would realize what he was doing. He finished “only when no more bodies could fit into the area designated for ‘Serbs,’” according to journalist Eyal Press, whose book Beautiful Souls recounts this story in more depth. Although Jevtić disobeyed his orders, he was faithful to something that was anchored deep inside himself, namely a reservoir of moral courage that expressed itself through acts of solidarity with others. His actions provide an inspiring example of the human capacity for nonviolent resistance, a force little understood but much needed to address the multiple crises that are weighing on the world today. What can be learned more broadly from cases like this? The application of basic human stubbornness - the capacity to refuse or withhold obedience when faced by a pressing moral choice - is the most widely-researched topic in the field of nonviolence, from explorations of proven methods of civil resistance to the stories of people who have said ‘no’ to taxes or conscription, torture or betrayal. As Hannah Arendt concluded when trying to understand the horrors of the 20th century, the bureaucratic pressure to ‘just follow orders’ can be extremely compelling, regardless of the human consequences. Against this background, it makes sense to emphasize non-cooperation with such demands as the key to transformation. But non-cooperation clearly has its limits in terms of creating social change. As Gene Sharp points out, people’s capacity for this form of action is embedded in human nature, but it is insufficient to achieve the long-term goals of peace and social justice. We have learned how to topple dictators, but not how to replace dysfunctional political systems so that tyranny does not return. We know how to launch new social movements like Occupy and those of the Arab Spring, but not how to sustain their gains by transforming society at large. So what provides the missing link between individual acts of moral courage on the one hand, and mutual cooperation to change the systems of society on the other? The answer is to recognize and activate our sense of shared humanity as a continuous and conscious choice. As Elinor Ostrom and others have shown, the ‘survival of the fittest’ is not just bad science, it’s completely inadequate as a guide to human behavior and societal evolution - which is just as well, since the world is facing a series of global crises that require large-scale, cooperative responses. The new science of cooperation developed by Fry, Ostrom and their colleagues doesn’t write aggression or competition out of the human story, but it brings in cooperation as a vital counterweight. Indeed, some research suggests that human beings are best understood as “super-cooperators” whose entire existence is an expression of caring and concern - from our first experiences in families to the behavior of those who risk their lives for strangers. Researchers at UCLA have discovered that “tend and befriend” behavior, which defuses tension by actively seeking out connections and common ground, is just as significant as “fight or flight.” As Jevtić showed, not every human being defaults to the latter instinct when under stress. Take Occupy, for example. When I interviewed activists from Occupy Oakland in 2013, many said that things got tough not when facing a common enemy, but when facing a common ally, as in each other. The other reason is that the modus operandi of most contemporary systems is to keep people from working together, especially around the things that really matter, like giving birth to a person-centered economy. Divide and rule has been stealthily injected into the culture of society by corporate media, for example, constantly pushing people towards separation and away from caring for each other. So while cooperation may be woven into our DNA, it still has to be cultivated consciously, and used, but how? It’s here that some deeper lessons can be learned from Jevtić’s heroics about different forms of power. Jevtić refused to cooperate with the Serbian army’s attempts to dehumanize other people. To that extent he reaffirmed his own humanity, but he also showed how a deep connection to the same humanity in others can make it possible to co-operate across the lines of difference, whether in extremis or in the regular activities of social movements like Occupy when they begin to fracture. Integrative power shows how acts of nonviolence can encourage the same response in others by helping them to connect with their own reservoirs of moral courage, so that they can sustain their efforts over time. It’s this creative force that can be translated into concrete political actions that go beyond civil disobedience, to underpin the practice of “pre-figurative politics:” creating new economic and political systems around a different image of what is possible, and who we really are. As Alexander Jevtić showed in Vukovar, deep cooperation with one another and with what’s most real inside ourselves is one of those impossible discoveries.